New development is good for economic growth and vitality of our towns and cities. But how do we deal with new development in existing places, especially when they are of historic and architectural importance? The Building in Context Toolkit was developed by English Heritage, CABE and the Kent Architecture Centre to encourage high quality and inclusive design of new development particularly in historically sensitive locations to ensure it responds to its context. A set of principles and criteria that encompass both the quality of a building itself and its contribution to the urban design of the surrounding neighbourhood. The principles provide a framework for local authorities, developers and communities to consider all the factors involved in the design of new development in historic areas and objective criteria to help make informed decisions. A range of case studies and policies and publications which provide more detailed information on specific elements of the design process to help improve and enhance the quality of new development in historic areas. Help local authorities and others to plan development in already built-up areas in the most efficient way – transforming them into more attractive places in which to live and work whilst actively conserving our cultural heritage and reinforcing identity of place. Promote sustainable development that reuses and does not sacrifice the assets which future generations will value for the sake of short-term and often illusory gains. It encourages sustainable growth. Communicate to elected members, professionals and community groups a wider understanding of how new interventions (buildings, structures and spaces) can successfully be undertaken in historic areas to create successful mixed use environments. Help those making decisions that affect sensitive areas to reach effective and balanced outcomes to create sustainable development that brings vitality and growth. Help communities with the process of taking long term decisions about their local built environment in a confident and sustainable way. It is a useful tool for those working on Neighbourhood Planning and other community planning exercises. © CoRE. 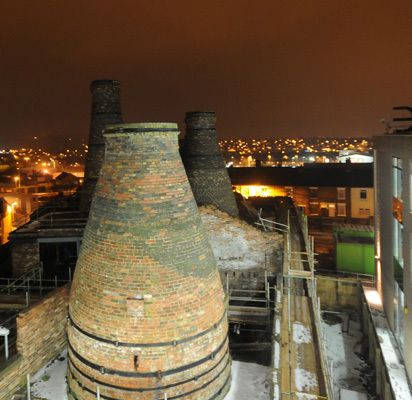 The Centre of Refurbishment Excellence (CoRE) are transforming a derelict pottery factory in Stoke-on-Trent into a centre for sustainable refurbishment.